In the middle of March 1969, a severe ice storm hit the southern Pennines. At the top of Emley Moor, the spun metal stays of the television mast twanged and whistled in the wind and great clumps of ice fell off, denting parked cars and piercing the roofs of houses. Since being completed three years earlier, the mast had acquired an ugly reputation among the surrounding villagers, who called it ‘the ice monster’. After receiving complaints from the council, the Independent Television Authority had installed signs on approach roads and a flashing amber beacon on the mast to warn of ice falls. Muriel Truelove, before taking over as landlady of the nearby Three Acres Inn eight weeks earlier, anxiously paced out the distance between the mast and the pub to see whether the former would hit the latter if it ever fell down. When the mast came down, tens of thousands of the region’s viewers, from the hill-shadowed villages of the West Riding to the coastal towns across the Yorkshire plain, were watching Discotheque, a children’s pop show on ITV presented by Billy J. Kramer. Suddenly, a few minutes before a comedy show called Do Not Adjust Your Set was about to start, their screens disintegrated into static. As soon as the television went blank in the Leeds control room, the duty engineer’s phone began ringing off the hook. Several callers demanded that the missed episode of Coronation Street be broadcast on BBC1 after closedown. Yorkshire TV’s switchboard logged over 5000 calls, mostly complaints about missing Coronation Street or The Avengers. Over the next three days, 17 Polish migrant workers put in 18 hour shifts in freezing 50mph winds to build a temporary mast that covered most of the region, allowing Yorkshire TV to claw back its haemorrhaging advertising revenue. The only part of the original mast that survives now does service as Huddersfield sailing club’s lookout tower, offering a panoramic view of the Boshaw Whams Reservoir. By the end of the 1960s, the television set burbling away in the living room had come to signify normality and routine. The people who rang the Leeds duty engineer to complain about missing Coronation Street gave little thought as to how its radio waves reached them. Television had become a mundane piece of wizardry, something only really noticeable when it broke down or was interrupted. 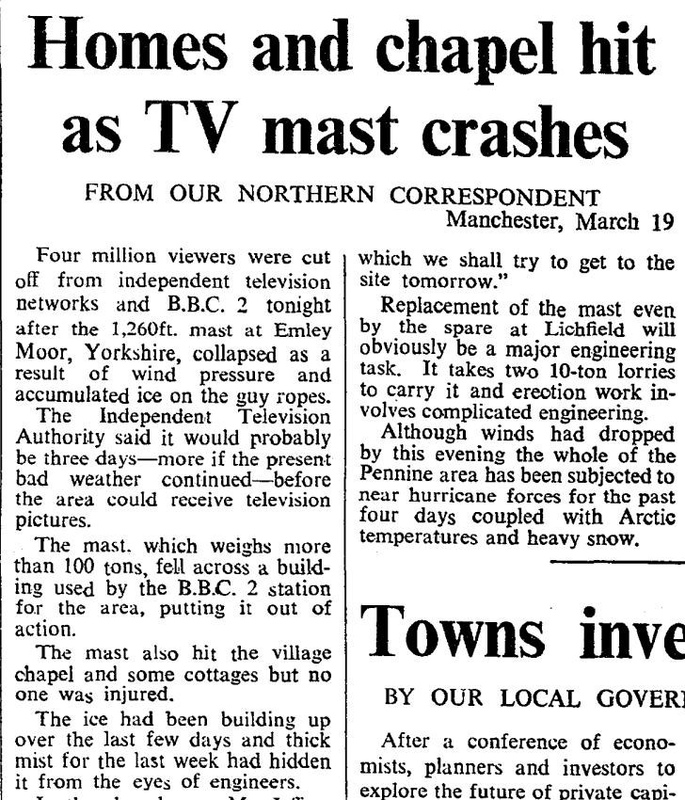 The collapse of the Emley Moor mast was a brief reminder of how much we take television for granted and how much it depends on apparatus that might, at any point, come crashing down on our heads. And yet TV transmitters once generated much public excitement. When the BBC’s Sutton Coldfield mast was completed in December 1949, it was poised like a giant pencil standing on its point, its tapering base resting on a ballbearing smaller than a cricket ball, which nested in a socket. Since rigid joints were vulnerable to metal fatigue and rust, this hinged bearing allowed the mast to move by up to two feet in high winds, supported by stays in the surrounding fields, as though it were a moored airship. This mast, wrote the Manchester Guardian, ‘does nothing to besmirch these pleasant wooded hills … Soaring fantastically from a two-inch steel ball on which it is poised, its slender stay-ropes reaching across the fields like the strands of a giant web, it could hardly be regarded by the most ardent rural preserver with anything but admiration and awe.’ Norman Collins, the controller of BBC television, was still more florid. ‘It is a beautiful sight – that slender, gleaming mast … it is the sort of thing that persuades me that, despite all they do to prove the contrary, engineers are artists at heart and, like other artists, have their lyrical moments, their supreme outbursts,’ he wrote. For a brief period the television transmitter was part of the industrial sublime, that awkward British genre which has emerged at various historical moments to get excited about railway bridges or electricity pylons. These high-guyed steel lattice masts were like modern-day cathedral spires, their sight and even their names – Holme Moss, Wenvoe, Kirk O’Shotts, Winter Hill, Caradon – evoking provincial pride and the arrival of a new object of worship, television, into a region. The Radio Times put a series of television masts on its covers, usually drawn by one of its favourite artists, Cecil W. Bacon: concentric circles of radio waves pulsing out from the top of the mast like ripples on water, and houses with aerials on top, waiting expectantly to receive the signal. Drawing in delicate pen or scraper-board in a way that resembled wood engraving, Bacon made these new structures seem both excitingly modern and familiarly British. The life of engineers in the more isolated transmitter sites like Holme Moss in the Pennines, and Kirk O’Shotts in the middle of barren north Lanarkshire moorland, was a peculiar and solitary one, resembling the hardy masculine culture of an Antarctic base camp. To cope with the extreme cold, the walls of the transmitter building were built double and the roof covered with a thick layer of vermiculite to protect against clumps of ice falling from the mast. The mast rigger had to climb it once a week in an insulating flying suit to chip off the ice and dislodge streamers, congealed wet fog clouds formed by strong winds. At Holme Moss, which was often snowbound in winter as heavy drifts formed on the flanks of the hill, the crew had iron rations and emergency living quarters. When the road was cut off, a local farmer walked across the snowy moors with bread, milk and eggs. During the long breaks in transmission in those early days, the mostly male members of staff amused themselves by playing cricket on the forecourt in the summer and sledging downhill in the winter. They would also play ‘drosser rolling’, a lethal-sounding game which involved liberating loose rocks from dry stone walls and rolling them down towards the reservoir a thousand feet below. Many of these original TV masts, including Holme Moss and Kirk O’Shotts, have stopped sending out television signals and now transmit mobile phone conversations or digital radio. The nameless engineers who kept television going in these remote places have long since moved on to other masts, retired or died. The remaining masts are mostly unsung in our cultural mythology, with a few eccentric exceptions. The Mancunian post-punk funk band A Certain Ratio recorded a song about the Granada region’s Winter Hill transmitter in 1981, which consists of 13 minutes of stubbornly monotonous drumming and a techno motif of just two alternating notes, meant to imitate a TV signal. The Yorkshire-born poet Simon Armitage once hymned the new 900-foot Emley Moor mast, a tapering, reinforced concrete tower completed in 1971, in a ten-minute visual poem for BBC2’s One Foot in the Past series in 1993, and elsewhere described it as ‘like the afterburn of a rocket disappearing into the clouds’. In a 1996 BBC2 documentary, I Remember the Future, the presenter, Jonathan Meades, stood at the bottom of this mast in order to give a sense of its height and surprising girth, and proclaimed it ‘established by aliens in 1966 [sic] in order that 30 years later this film might reach you’. 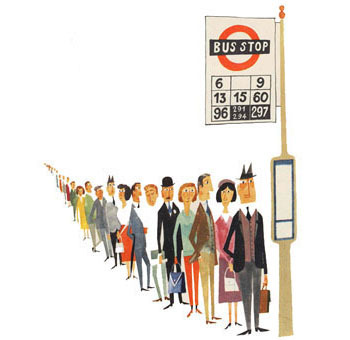 These ‘punctuation marks of human supremacy’, he mused, belonged to ‘that brief and far off parenthesis when Britain was modern’, the third quarter of the twentieth century, when public architecture was ‘self-celebratory, bloated, grandiose’. No one, except the odd non-conformist like Meades, rhapsodises about TV masts any more. In the analogue era, television depended on the power of the transmitter, and how far its radio waves could reach from the top of a hill. But in the digital age, television is not so reliant on geography and landscape; as well as radiating from transmitters it can live on internet catch-up sites and be downloaded on to laptops or mobile phones. Those of us raised in an analogue world can remember each medium’s flawed attempt to transcribe a message from one physical object to another: the white noise of the radio, the hiss of the cassette tape, the crackle of stylus on scratched vinyl or the flicker of electrons against the back of the cathode ray tube. But digital media store information in binary ones and noughts that bear no telltale trace of whichever material objects are used to carry and decipher these abstract symbols. On a cathode ray tube, the numberless electrons had to be continually fired at the back of the phosphor-coated screen to make each millisecond of television picture and pull off the illusion of persistent vision, so no two televisual moments were exactly the same. On a digital television, each pixel is the product of binary code that can be endlessly decoded and revisited. Television no longer needs to move from one place to another at a unique moment in time. Now it seems to come from nowhere and be everywhere, as omnipresent as the air.